My husband was reading a book out at the farm earlier this week called "No Turning Back: A Witness to Mercy" by Fr. Don Calloway. He was so engrossed in it that he would scarcely look up or respond. I had met Fr. 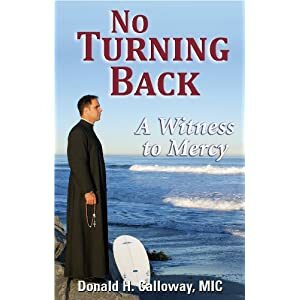 Calloway in college -- he was a young, cool, passionate priest who gave dynamic and riveting homilies about the Blessed Mother. Only after graduating did I discover he was a "somebody" in the Catholic world, when I heard him on EWTN. I'd had no idea about his sordid past. I asked my husband to stop reading so we could enjoy it together later. He twinged a bit, as if to say, "but it's so good! I can't stop!" What a darling he is; he immediately put in a bookmark so I could catch up. So yesterday I picked up the book. From the very first paragraph I knew it would be good. It took every shred of willpower not to read past that bookmark! The hours felt like days until he got home last night. I passed the hours by sitting outside and feeling the cool breeze of an impending thunderstorm... the first of the year. But as soon as he walked in I yelled: "Okay! Let's read it!" He'd picked up some goodies from the grocery and we snuggled in for a long night of reading aloud, amidst the glorious peals of thunder. We were up until 3am. I will admit that at some points the book begins to get tedious. You wonder how many more drugs he can do, how many more scrapes he can get into, how much more miserable he can become. But the moment at which you think you can't stand it anymore and he's gonna die, all heaven breaks open and floods him with grace. Wow. It's a conversion story to rival Augustine, Ignatius, Francis and... yes, even Fr. Corapi. Read it. Buy it. Buy copies to give to others. Buy copies for others to give to others. It is a remarkable witness to mercy. such an awesome story! :) i have it on cd somewhere...i think...i moved 3 times between july and february, so it really could be anywhere.